to the DRM Software Radio Forum back in 2005). 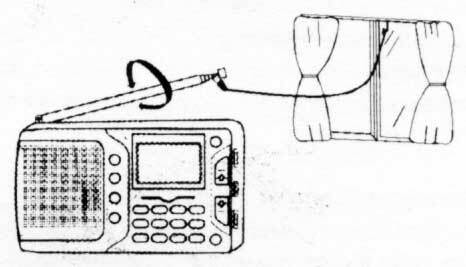 A portable DRM Medium- and Short wave receiver. I was offered the KK-DRM01 for USD 50.- FOB Hong Kong back in 2005. It is a "DRM FM Stereo Two Band SW radio" according to their HK office. They did not mention whether there was a PC included in the FOB price. Finally I got this receiver free of charge after some correspondence with Hong Kong, suggesting that I wanted to do some measurements on it. The little wonder KK-DRM01 arrived by courier delivery, but without any software-CDs. The radio was shipped in nice gift box and packed in a cute pouch with tassles. It came with some printed instructions in English and German, a charger, stereo earphones, a connecting cable with 3,5 mm stereo plugs and an antenna wire with a hook and an alligator clip attached. 9.500 - 26.100 MHz in 5 kHz steps. 87.5 - 108.0 in 100 kHz steps. There is a gap between 7.3 and 9.5 MHz which means that BBC (in 2005) on 7.320, 7.465 and 9.470 MHz were not possible to receive. The 12 kHz output on the Kchibo KK-DRM 01 is a 3.5 mm diameter Stereo (!) plug. The "R" and "L" channels are wired in parallel. That means if you plug in a Mono plug, you will shortcircuit the 12 kHz to ground and nothing works. When you connect a PC via a shielded audio cable the KK-DRM 01 still picks up noise from the PC, even if the cable is 10 meters long, so that the receiver was placed well away from the computer. The 12 kHz DRM output signal seems to be very low at weak RF input signals so that the level might be too low for the Line Input. Use the Microphone Input instead. The DRM signal should be strong, or at least rather strong. The DRM station should operate on 9 MHz or lower. BBC on 1296 kHz was decoded quite OK, but the receiver is not overly sensitive on the ferrite antenna. On Short Wave RMC (Monaco) on 6175 kHz was fairly good, Radio Luxembourg on 7295 kHz too, but the reception result was still not very impressing. The radio liked Deutsche Welle. On 6 MHz, I should add. Deutsche Welle from Sines on 15440 kHz was received with a strong and stable signal, but the MSC CRC in Dream wouldn't light up, which meant that there was no decoded audio. Note: All RF measurements were made with the signal generator connected to the (collapsed) telescopic antenna and the coaxial cable shield connected to the ground of the 12 kHz IF output socket. When I fed an RF signal from the signal generator to the KK-DRM01, I measured 11.800 kHz on the 12 kHz output. The 12 kHz output impedance is low, less than 600 Ohms. The AGC (Automatic Gain Control) in the receiver is not very efficient. 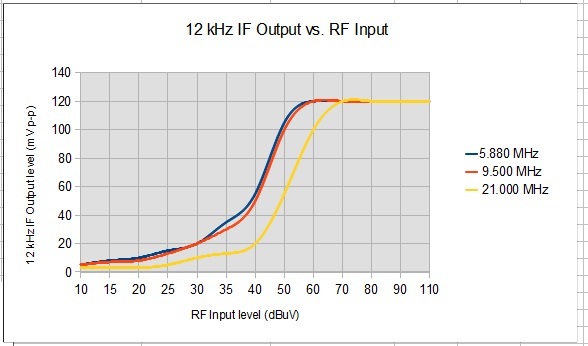 The output level varies a lot depending of the input signal. Eventually the AGC sets in, but at rather high input levels. 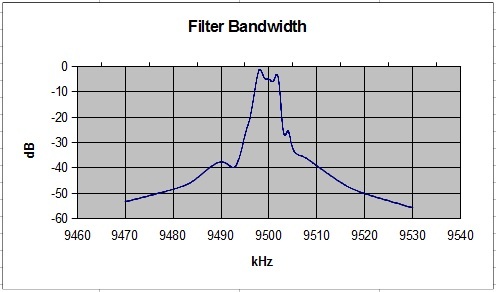 Weak DRM signals produce very little 12 kHz IF to the sound card of the PC. How good (or bad) ist this receiver? The image frequency response is low. Very low. It is 3 dB at 15 MHz. The image attenuation is virtually nothing at frequencies above 15 MHz. Imagine all the noise 900 kHz up which is added to the DRM channel. That probably explains why DRM reception is almost impossible on higher Short Wave frequencies. Is it a single or double conversion receiver? There is nothing mentioned in the specification. There was no Service Manual enclosed in the parcel. The "Single Signal Selectivity" is mentioned in the manual as "= 16 dB" which must be a misprint! The receiver is a single conversion superheterodyne and the IF frequency is 450 kHz. The Local Oscillator is f(RX) + IF. The adjacent channel selectivity (±10 kHz) is 26-27 dB over the entire Short Wave range, measured with two signal generators which can be rated as sufficient for this kind of receiver. I read somewhere that the engineers from Kchibo travelled many times to the Communications University of China (yes, that's what I read), why did they not make one more trip to discuss double conversion!? I let it play all night on batteries while logging 3995 kHz just to see how long the batteries would last. I measured the current consumption to 38 mA in "DRM mode" with the same batteries I had used the night before. ("DRM Mode" is turning the volume control to zero - hi-hi! ). The Kchibo defintively does not like antennas. At the beginning of a logging session I had a 4 meter long PVC insulated wire directly connected to the telescopic antenna. Then I wound the insulated wire 4 turns around the telescopic for a while and then continued later with 3 turns. When the wire was directly connected to the telescopic I noticed some carriers inside the DRM signal in the waterfall spectrum. I could also see very narrow band text transmision (it looked like PSK31), probably ham radio related just below the DRM spectrum. These spurii disappeared when the wire was inductively coupled to the Kchibo. I inquired a couple of times to Hong Kong regarding the limited frequency range. There was no reply to my questions. I wrote to Hong Kong again on the 15th of November 2005 and sent a reminder on the 6th of June 2006, but so far there has been no feedback and probably that's final. At the time of writing this receiver probably is history. 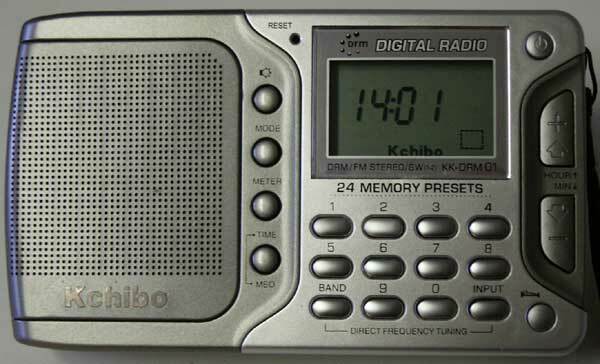 After having to put up with the KK-DRM 01 for more than 3 weeks during my "working holidays" in Sweden (the only receiver I had with me), I have decided that the BEST thing with this radio is the DIGITAL CLOCK.... This receiver is not at all suited for DRM reception. And, it is not worth wasting any more time to find out why. It is possible to receive your local FM stations, that's all. But the radio is still working. I still use it as a clock in the office. The Kchibo radio died. I don't know when it did, but it is dead. After putting in new batteries nothing happened. No display. No reaction at all. I don't miss it very much. After all I got it free of charge. And the clock was not very accurate either.